We’d love your help. Let us know what’s wrong with this preview of Saving Audie by Dorothy Hinshaw Patent. To ask other readers questions about Saving Audie, please sign up. Saving Audie by Dorothy Hinshaw Patent is one of the most amazing animal stories I've read. It's the true story about a pit bull puppy rescued from Bad Newz Kennels, a dogfighting kennel created and maintained by NFL quarterback Michael Vick. The book follows Audie's recovery and challenges with his new owner. I was astonished by all the beautiful color photos of Audie with his owner. The book also discusses a few of the others dogs who were rescued. It's unbelievable that people can be so cruel Saving Audie by Dorothy Hinshaw Patent is one of the most amazing animal stories I've read. It's the true story about a pit bull puppy rescued from Bad Newz Kennels, a dogfighting kennel created and maintained by NFL quarterback Michael Vick. It's unbelievable that people can be so cruel to animals. This book is a wonderful tool to teach children about being responsible, caring for, and nurturing animals. I loved all the added educational material in the back including: what is a pit bull, BAD RAP animal rescue organization, information for further reading, and the Michael Vick Case timeline. In April of 2007, authorities raided scumbag Michael Vick's Bad Newz Kennels. There they discovered evidence of a dog fighting ring. The dogs, mostly pit bull terriers, were hauled away to be kept as evidence until the trials were concluded. Then the animals were scheduled to be put to sleep, as it was assumed they would be too dangerous to live around people and other animals. But, several animal rights groups asked the court for a chance to test the pit bulls to see if they were safe to handle In April of 2007, authorities raided scumbag Michael Vick's Bad Newz Kennels. There they discovered evidence of a dog fighting ring. The dogs, mostly pit bull terriers, were hauled away to be kept as evidence until the trials were concluded. Then the animals were scheduled to be put to sleep, as it was assumed they would be too dangerous to live around people and other animals. But, several animal rights groups asked the court for a chance to test the pit bulls to see if they were safe to handle. The results were surprising. Despite their cruel beginnings, and having spent months penned in cages, out of 49 dogs tested, all but one were ruled safe to be companion animals. This is the story of Number 86, and the couple who adopted him. Dutch was later renamed Audie, after war hero Audie Murphy. The author reveals how Audie worked through trust issues, and attended obedience classes, easily passing his Canine Good Citizen test. Then it was discovered that Audie needed surgery to correct a problem with his knees. 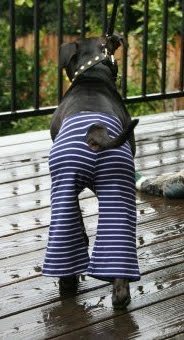 No Cone of Shame for this pup - his owner made him wear little pants so he couldn't chew his stitches. Ba-ha-ha! Sorry - I crack up every time I see that picture. When Michael Vick's kennels were raided, officials planned to put all the dogs to sleep. After all, their life at the Vick kennels consisted of training to fight to the death and being underfed to encourage aggressive behavior. Many believed these dogs mostly likely could not be rehabilitated and needed to be put down. The spotlight on this case due to Vick's professional football career worked in the dogs' favor, however. People rose up in protest over the dogs' destruction. An agreement was st When Michael Vick's kennels were raided, officials planned to put all the dogs to sleep. After all, their life at the Vick kennels consisted of training to fight to the death and being underfed to encourage aggressive behavior. Many believed these dogs mostly likely could not be rehabilitated and needed to be put down. The spotlight on this case due to Vick's professional football career worked in the dogs' favor, however. People rose up in protest over the dogs' destruction. An agreement was struck: each dog would be individually evaluated to determine its chances of rehabilitation. If a dog showed promise, it would be allowed to live. After extensive testing, all but one of the Vick dogs was deemed fit for rehabilitation. This book follows the story of Audie, a black pit bull puppy who was rescued from the Vick kennels. Audie turned out to be obedient, loving, and highly trainable. This is just the kind of story you want to see come out of a horrible situation like the Vick kennels. I found it regrettable that the photos were not sharper. I understand from experience that fast-moving puppies are hard to capture clearly, and perhaps they were working backwards here, using existing photos rather than taking new ones, but the images just weren't as crisp and focused as they could have been. That's really the only negative I found in the book. Michael Vick, NFL quarterback, was running an illegal dog-fighting ring and raising “fighting dogs” at his appropriately named “Bad Newz Kennels.” When information about his crimes came to light, the dogs were seized, as evidence, and spent many months in isolation in an animal shelter. In the past, fighting dogs were considered dangerous and people thought they were not good prospects for rehabilitation. In the case of Vick’s dogs, however – probably because the case was so high profile and rec Michael Vick, NFL quarterback, was running an illegal dog-fighting ring and raising “fighting dogs” at his appropriately named “Bad Newz Kennels.” When information about his crimes came to light, the dogs were seized, as evidence, and spent many months in isolation in an animal shelter. In the past, fighting dogs were considered dangerous and people thought they were not good prospects for rehabilitation. In the case of Vick’s dogs, however – probably because the case was so high profile and received a lot of media attention – animal rights groups and concerned citizens got involved and the dogs were eventually tested for temperament. Out of 49 dogs, only one was deemed unsafe. The rest were sent to live in foster homes and other shelters where they received obedience training and learned to live and interact with people and other animals. Saving Audie is a book that could be used for low level middle school readers. I may also be capable of sparking a good discussion with this age group. Saving Audie is the tale of one of the Vick Dogs. The beginning of the book instantly pulls the reader in describing the puppy's horrible life at Bad Newz Kennels. The book goes on to touch briefly on the trial from Audie's stand point - what Audie was going through as the trial went on. Audie goes on to be adopted by a family involved with the B Saving Audie is a book that could be used for low level middle school readers. I may also be capable of sparking a good discussion with this age group. Saving Audie is the tale of one of the Vick Dogs. The beginning of the book instantly pulls the reader in describing the puppy's horrible life at Bad Newz Kennels. The book goes on to touch briefly on the trial from Audie's stand point - what Audie was going through as the trial went on. Audie goes on to be adopted by a family involved with the BAD RAP Rescue Group - one of the groups responsible to getting all of the Vick dogs rescued and rehabilitated. Audie moved in and the family soon realized that she would need surgery to fix his knees (paid in full by the money the court ordered Vick to set aside for the dogs). After a long recovery Audie goes on to be a Agility dog and an ambassador for the breed. This heartwarming story also give updates on a few other Vick dogs that Audie regularly hangs out with. This tear jerker, for any aminal lover, tells a wonderful tale of survival. It shines a bright light on the Pitbull breed - A MUST READ!! Rescuing the dogs was just the beginning. Most of the dogs, like Audie, had severe emotional problems due to the horrid conditions that they faced. These dogs were scared of humans as well as other dogs. However, if the dogs cannot learn to trust the humans that r This children's book tells the tale (no pun intended)of Audie. She was one of the 40 Pitbulls rescued from the Michael Vick dog fighting scandal. While Audie was no longer forced to fight, she still faced a battle. The one for her life. Saving Audie by Dorothy Hinshaw Patent with photographs by William Munoz is the story of one puppy saved from the horror of the Michael Vick fighting ring. The story is told through photographs that capture not only the fear and sorrow of the dogs taken from the raid, but also show the joy and exhuberance that the dogs were free to experience in their new surroundings once rehabilitated. In The Lost Dogs by Jim Gorant, the story of the raid and rescue of the Michael Vick dogs is told in all its ho Saving Audie by Dorothy Hinshaw Patent with photographs by William Munoz is the story of one puppy saved from the horror of the Michael Vick fighting ring. In The Lost Dogs by Jim Gorant, the story of the raid and rescue of the Michael Vick dogs is told in all its horror. From the investigation to the rescue of the dogs, the story uncovers the brutality of dog fighting. Cute story about a pit bull puppy from Bad Newz Kennels (ala Michael Vick) which was raided by the government. Like most of the Vick dogs, Audie was taken to a shelter and kept as evidence. Animal organizations such as BAD RAP, Best Friends Animal Society and the ASPCA got involved and the courts allowed the dogs to be tested to determine how safe they were to handle. A friend of two BAD RAP members adopted one of the puppies and named him Audie. They socialized him and took him to obedience cla Cute story about a pit bull puppy from Bad Newz Kennels (ala Michael Vick) which was raided by the government. Like most of the Vick dogs, Audie was taken to a shelter and kept as evidence. Animal organizations such as BAD RAP, Best Friends Animal Society and the ASPCA got involved and the courts allowed the dogs to be tested to determine how safe they were to handle. A friend of two BAD RAP members adopted one of the puppies and named him Audie. They socialized him and took him to obedience classes, where he ultimately obtained his Canine Good Citizen certificate. the thing I loved most about this book (kid's book) is that it tells a different side of pit bulls and dogfighting issue. People need to know that the Vick dogs were ALMOST all save-able and had lovely but hard lives after they were rescued. People also need to know that dogs DIE during dogfighting...not just get hurt (which is bad enough) or their owners kill them when they lose. This does not all need to be told to a child, maybe mention they get hurt, but kids will love the pictures in this b the thing I loved most about this book (kid's book) is that it tells a different side of pit bulls and dogfighting issue. An uplifting story of the rehabilitation of one of Michael Vick’s fighting dogs. This book for children has lots of information about dogs including, Canine Good Citizen, Agility, and obedience and how dogs learn to get along with other dogs and people. I especially appreciated Ms. Patent’s “Further Reading and Surfing” section with places for learning more about dogs, their care and training. Mr. Munoz’s photographs are bright and appealing, so realistic you can feel the puppy’s moist nose. I wa An uplifting story of the rehabilitation of one of Michael Vick’s fighting dogs. This book for children has lots of information about dogs including, Canine Good Citizen, Agility, and obedience and how dogs learn to get along with other dogs and people. I especially appreciated Ms. Patent’s “Further Reading and Surfing” section with places for learning more about dogs, their care and training. Mr. Munoz’s photographs are bright and appealing, so realistic you can feel the puppy’s moist nose. Fast read, but a great book for kids wanting to learn about the Michael Vick pit bulls and how they were rescued and given a second chance. After reading "The Lost Dogs" this book showed me what happened to one of the dogs that was mentioned in the book. I remember Dutch - now Audie - and it was nice to see pictures of him in his new life. This book is being used as part of a research project my students have created for their nonfiction section of the class. 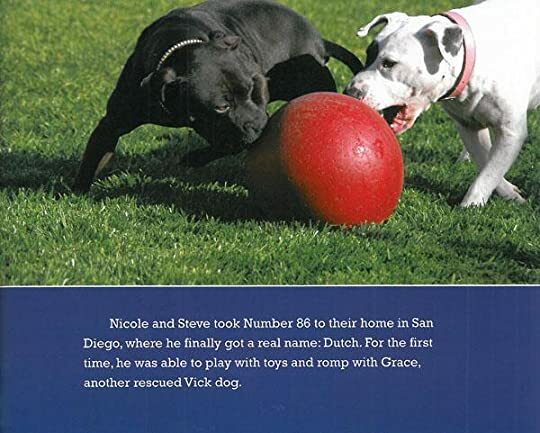 A lovely non-fiction picture book suitable for young children about one of the Michael Vick's dog-fighting ring dogs who is successfully rehabilitated into a family pet. This book does a lot to dispel the myths about fighting dogs and pit bulls and is also just a great read for any animal lover. I brought this to my school visits this year and the kids really liked it...who doesn't like pictures of cute dogs? I loved this book! It's another example of non-fiction that is geared towards children which I think is really important. It's about one of the dogs that was rescued from the Michael Vick dog fighting ring. It's a completely true story that is heart-breaking at times, but has a happy ending so I think kids would like it. My heart really reached out to the dog in this story, so I'm sure that children would feel that way too. Beyond the first page, this piece focuses on how Audie and others like him got a second chance, covering both the legal efforts of BAD RAP and the ASPCA and the logistics of fostering and socializing abused animals in a way that is accessible to a child reader. The timeline at the end also factually points out the outcome for Michael Vick, which the observant child reader may note and be outraged by, but overall the story is about the Pit Bull pups and the people who saved them. In 2007 Michael Vick's horrific dog fighting kennel was discovered and broken up. The dogs were all taken as "evidence" and held for six months when they were released for rehab and rehoming. This inspiring book follows the story of #86 from his rescue, through his rehab by BAD RAP, to his current life. For more book reviews from the HPPL Youth Department, click here. If anyone knows me, they know I adore pitbulls! 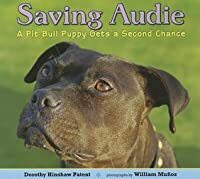 This picture book made me cry and ultimately rejoice that Dutch #32 renamed Audie got a second chance at life because not all of Vick's dogs did. And it just sickens me that Vick got a second chance as well, but everyone deserves one right? No matter what they did. Reading about how most of the dogs liberated from the concentration camp "kennel" of Michael Vick (disgusting excuse for a "human" being & pile of dung) have had happy endings is always pleasing. Audie's story is inspiring and heartwarming. Too bad that that sociopath only did a year and a half in jail. Too bad he did not share the fate that befell the dogs that lost fights in his "kennel". As a child, my favorite activity was exploring nature, especially finding animals like frogs, toads, and lizards. I kept tropical fish, had a dog, and loved riding horses. My love of animals led to a Ph.D. degree from U.C. Berkley in Zoology. In grad school I met and married fellow student Greg Patent. Our two sons, David and Jason, were born before we finished school. I wanted to use my training As a child, my favorite activity was exploring nature, especially finding animals like frogs, toads, and lizards. I kept tropical fish, had a dog, and loved riding horses. My love of animals led to a Ph.D. degree from U.C. Berkley in Zoology. In grad school I met and married fellow student Greg Patent. Our two sons, David and Jason, were born before we finished school. I wanted to use my training and my knowledge, but I also wanted to raise my sons and be there for them when they needed me. I decided that writing the kind of books I'd always loved reading was a good solution to my dilemma, and that turned out to be true. One of my favorite things is learning new "stuff," and every time I tackle a new book project I get to indulge myself in that passion. I'm a lucky gal!